I have a confession. I am mildly obsessed with plastic animals painted one solid color. My favorite animal is the Rhino, but I don't discriminate when it is a fun color like hot pink or lime green. This brings me to my DIY project this week! 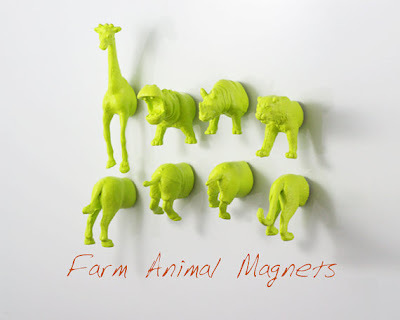 I found these awesome plastic animal magnets on Etsy and I am going to try my hand at making a set. My plan is to find some plastic animals (at Walmart or Target) and cut them in half (using a saw) and then spray paint them a fun color (or 2) and glue a magnet to the flat side. I am very excited to see how these turn out! Come back on Sunday to see!